Teachers, school officials and architects at DLR Group came up with an ‘archetype' for designing schools by looking closely at what spaces are really needed. As districts go, Federal Way Public Schools is far from rich. So when faced with the need to rebuild some schools and move the sixth grade to middle school, the district wanted to find savings wherever it could. It found them through a creative process with the multi-disciplinary firm DLR Group that yielded the basic design elements for four replacement elementary schools. 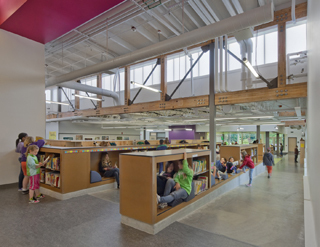 The process was called the Federal Way Elementary School Archetype, and it won a citation at AIA Seattle's 2012 Honor Awards for Washington Architecture. 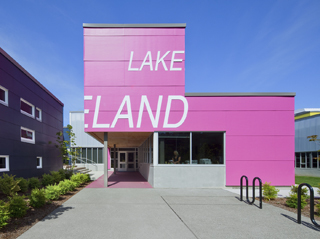 One of the four schools that resulted from the process, Lakeland Elementary School, received an honor award — the top recognition — from AIA Seattle. It's rare for grade schools to break into this design echelon. But what's more remarkable is the modest cost of construction. According to the design team at DLR Group, the four schools were built for between $200 and $250 per square foot, including site costs. Take the school library. You can blame the absence of a traditional library in the four new schools on any number of factors, said Leland, including the Internet, computers and mobile devices. But as the district prepared for a new generation of buildings, a local study showed that a small fraction of students were actually using the library to check out books. That finding helped to support a decision to drop the term “library” from the program and planning of the schools. But not the books. At Lakeland books are actually found in the wide, ramped hallway, where low built-in walls contain alternating bookshelves and comfy reading niches. Other reading materials are on stacks along the walls of a central corner that can be adapted for a number of uses. You might even say that the schools themselves can be read like a book. The visual impact from outside is one of big blocks of bright color with billboard-scale text, spelling out the names of the schools: Panther Lake, Valhalla, Sunnycrest, Lakeland. This is probably not the corner school you would present to an upscale bedroom community with long-time residents. But Federal Way is different. According to Leland, more than 100 native languages are spoken here. Over 50 percent of students qualify for free or reduced cost lunches, and about 60 percent come from families who live in rental housing. The Federal Way Elementary School Archetype may look like a prototype design, said Noah Greenberg, the principal at DLR Group who managed the project. But the word prototype implies a similar layout for multiple buildings that just doesn't exist here. But it's hard to describe what “archetype” actually means. There is a master set of components, a conceptual kit of parts that do not match a traditional design program for schools. With the exception of things like “gym” and “admin” and “kitchen,” there is a whole set of new pieces, based on uses that are more generalized. Instead of a traditional library, shelves for books and niches for readers line a passage inside Lakeland Elementary. For instance, the rooms meant for teaching, which would be called “classrooms” in any conventional program, are instead re-classified according to some fairly standardized dimensions based on a close study of diverse curriculum needs and uses. These spaces are fitted together into the larger pieces in the kit-of-parts — bar-like building wings that can be arranged to fit the site. With all this ordering and reordering of the school design program, the most important part of the design became the internal connecting spaces. This is what the design team calls the “network,” according to architect Craig Mason, the DLR Group principal in charge of design for the project. In fact, these central interior spaces are almost alive, so various and strange in shape and plan. And they are different in each school. They serve — in programmatic terms — primarily as circulation. But they also include spaces for impromptu and temporary classrooms and activity centers, and even intimate, movable seating areas. Most importantly, they orient young students to everything inside the place in an instant — making old-fashioned hallways seem dismal and even inhumane. There is a lot of natural light from many directions in most parts of the school. But in the network spaces there is also a connection to the ground. The concrete floor in the wide-open circulation area at the center of Lakeland Elementary ramps upward on one side of the entry and downward on the other. This small interior hillside is instantly orienting. Always, the emphasis is on flexibility — in space and in time. In the plan of each school, there are a limited number of structural walls, each meant to last the lifetime of the school. But other interior walls are designated “20-year walls” and even “5-year walls.” Some partitions are louvered for instant repositioning because the architects and the district wanted to literally build in the option to change the floor plan as needed. Lakeland Elementary is a little disorienting if you are looking for a hallway or other typical spaces. Not only are there books in the corridor, there are also sinks for washing hands. The desks of most administrators are not behind walls, they're in the open beside the entry. That, according to Greenberg, is because this is not just a school. Jury comments: “A remarkable and innovative approach to this building type. Appreciates conceptual development of a prototype, which is then realized in a built work.